These super thick protein pancakes are only for those with a hearty appetite. 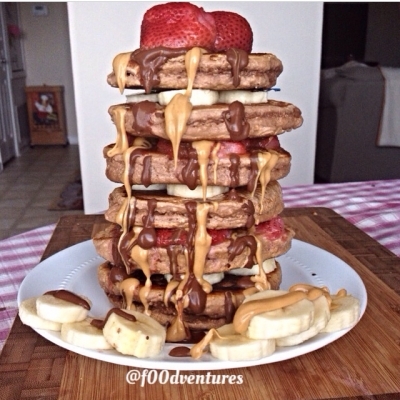 These banana split inspired pancakes are layered with banana, strawberries, peanut butter, and chocolate. mm mm good. Combine ingredients and mix well. Add enough milk to form a batter. Cook pancakes on skillet a few minutes on each side until cooked. Let cool then layer with strawberries, banana, peanut butter, and melted chocolate or baking cocoa mixed with water.